I am very impressed by this Tracker Free Video Analysis & Modeling Tool by Douglas Brown. It allows for learning in the context of real life video captured by the learners, analyze the video, even do a modeling of the equations to test their hypothesis of the equations that closely model the real life physics. Tracker is free software; you can redistribute it and/or modify it under the terms of the GNU General Public License. Video modeling is a powerful new way to combine videos with computer modeling--and only Tracker can do it! For more information on video modeling. Thanks Douglas Brown dobrown@cabrillo.edu for his amazing tool. Douglas Brown has made Tracker better by releasing 3.1 version which has auto tracking function. I emailed him about the possibility of adding it and you know what, he is the man! He added it about 3 months time. cool! anyway, my friends in school wanted me to conduct PD on the use of this wonderful tool. so i am exploring it again, the other time was Oct-Nov 2009. I will be making a youtube to explain how to use it for video modeling purposes. not only does it autotrack, if it can't due to poor fitness of track object, you can also manually assign new objects in different time frame. Hi prof hwang, can enable file extension? You cannot upload that type of file. The only allowed extensions are gif,jpg,mpg,pdf,png,txt,xml,java,html,jar,ip,avi,swf,zip,doc,mov,jpeg,htm,jqz,rar. I just added trk extension for upload file. i guess it is due to the ruler, perhaps i didn't choose 1 meter correctly. Reply if you know why.thx! Youtube Professional Development video by lookang. Video modeling is a powerful new way to combine videos with computer modeling--and only Tracker can do it! Use to analyze or model your own video experiments. this video is licensed under Creative Commons Attribution-Share Alike 3.0 Singapore. It is just great! I like the youtube movie you have created. part 2/2 for the series of professional sharing. A write up for a website about our ICT journey. Sport science is a discipline that studies the application of scientific principles and techniques with the aim of improving sporting performance. Sport science incorporates physiology, psychology, motor control, bio-mechanics, nutrition, etc. Sports scientists and performance consultants are growing in demand and employment numbers, with the ever-increasing focus within the sporting world on achieving the best results possible. Through the study of science and sport, researchers have developed a greater understanding on how the human body reacts to exercise, training, different environments and many other stimuli. a. suitable video taking techniques and strategies for capturing sports video suitable for 2 dimensional analysis. b. construct valid basic physics principle(s) in the sport science activities as chosen by the group of three students. c. within the time frame of 1 holiday week with 2 school week for preparation and consultation with the teachers. d. able to collaboratively work in teams and summarize their scientific findings in a written report of less than 10 pages with their general strategy, based on scientific knowledge and understanding, detailed procedure, data collected and how it is processed, conclusion, recommendations and evaluation of their investigation. 2. Use the video analysis and modeling software http://www.cabrillo.edu/~dbrown/tracker/, to support their investigation of one sport activity or event and able to perform an in-depth study of the science (especially physics) of sports. How was the lesson carried out? First 1 hour lesson is to introduce the video analysis and modeling software to the students. Teacher explains the affordances of the technology tool and demonstrate step by step how to get the software to run on a computer. A second (Technology-Pedagogy-Content Knowledge) TPCK experienced teacher serves as facilitator to support the help students who have difficulties operating the computer and software. The main teacher goes through the sequence of conducting an in-depth video analysis of a bouncing basketball ball video and the various groups of students learn by doing on their own computers the sequence of steps. The second teacher has to go round very frequently between the groups to support their learning journey. This lesson sequence covers launching of software, importing of video, set axis, set ruler, manual tracking of point mass being analyzed, using the plot graphs to visualize the motion (sy, vy, ay) with respect to the time axis, defining own variables to investigate on etc. An second video on the collision of two carts can be used as a hand-on activity to allow to explore the newly learned steps and tools and apply it on the new video. Students will perform a 2 mass analysis and visualize the own selected graphs to verify the principle of conservation of momentum and deduce the type of collision (perfectly elastic, partially inelastic or perfectly inelastic) depicted in the video. After the activities, the teacher can then explain the rubrics used to assess the student's learning and written report, and provide a sample report conducted by a model group of student's sample written report as reference also available in the schools online learning portal. Highlight to the students that this assignment contribute to 4% of the 1/2 yearly grade so that the tasks and expectations are communicated clearly. By another 7 days time to monitor and set the students into the learning tasks, students are to submit a a summary, no more than two A4 pages, of your investigation aim and procedures to their physics teacher. In addition, they will attach a school available equipment request list for their investigation, for example a meter rule etc. A holiday assignment task list should be given, clearly pointing the download link of the video analysis software http://www.cabrillo.edu/~dbrown/tracker/, some video taking specification 30 frames per seconds and digital file output of .avi or .mov are supported. The whole Year 5 (JC1) physics students will need to perform this assignment. Digital video in .avi or .mov format, readily available video on science of sports are acceptable. Online discussion forum for consultation with teachers and peer support. 1. Compare videos of the real world to simulations of theoretical models. 2. Students define force expressions, parameters and initial conditions for dynamic particle model simulations based on Newton's Second Law. 3. Model simulations synchronize with and draw themselves right on the video. - overarching vision is to prepare students more for life than for examinations. - students have been doing well in external accountability examinations but multiple sources of data points to a lack of deep understanding, critical thinking due to lack of more holistic and performance based assignments. Holiday week is a good opportunity to test out the intervention assignment, ample time to reflect on the real life learning in authentic situations (sport analysis), riding on the event Singapore 2010 Youth Olympic Games. *Consider the root causes of present achievement, and then—and only then—implement systemic actions to address root causes, promote enduring learning, and increase test scores. -systemic actions includes refocusing on student centered pedagogy with skillful teachers as facilitators of learning journey. A suitable blended of teacher centered lectures with demonstrations coupled with much needed students centered pedagogy and activities to give the experiences in the students to situate their understanding. In this way, RVHS has identify priorities, monitor results, and target actions that improve student learning. Students conduct real life physics projects on a personally motivating sports activity of their choice and make sense of the science involved. Yes! students compare videos of the real world to simulations of theoretical models. Students need to decide and think how to define force expressions, parameters and initial conditions for dynamic particle model simulations based on Newton's Second Law. The free and open source software allows model simulations to be synchronize with and draw themselves right on the video at the correct frame. The software also provides instantaneous feedback of scientific variables in plot or table form and data analysis (curve fit, area under curve etc) tools are in built the software therefore no need to export the data out to another software like excel spreadsheet to analyze trends. The online discussion forum provide peer support and promote teacher interactions with the different groups of students can provide the guidance and support to continually provide feedback on the learning tasks. The video modeling aspect transform the way students learn to be scientists through analyzing sport video, is conducted without computers it will be analyzing many still frame photos. students are engaged in self-directed learning. 1. Ownership of Learning, students decide on a personally motivating task to conduct inquiry on, use the video analysis software and identify variables to inquiry on, define their own equations to analysis and input their own equations of motion to model the motion. 2. Management and Monitoring of Own Learning, students explore video based experimental data and make logical arguments and findings. Students formulate questions and generate own inquiries when conducting the holiday assignment guided by face to face as well as online teachers and peer support and discussions. Students use the online feedback form to improve their learning experience using the video analysis software. 3. Extension of Own Learning, students are taught the pedagogical use of the tool and perform similar inquiry on different video of their choice. Learn beyond the curriculum, students are expose different aspects of physics and other subject matters in the sports and figure out like real scientist when to use which concepts to analyze the video. Effective Group Processes, in groups of three, the students need to negotiate and set common goals to explore a video of their choice. Individual and Group Accountability of Learning, students learn in groups of three, share their initial findings on the discussion forum, supported by peers evaluation and teacher mentor-ship. Most teachers have not used this tool before may expressed some resistance to learn the video analysis software. One professional development session needs to conducted to the teachers to familiarize them with the pedagogical strengths and convinced themselves that this software allows the learning of physics, traditional pen and paper exercises without perform. 2 YouTube video have been prepared and shared to the teachers and students that can be viewed on their handphones, enhancing the accessibility aspects of the professional learning community. The tool can help the teachers to be more comfortable using technology during lessons. A second teachers could be made available during their lessons to provide additional support and conduct the week 1 introducing the tool lesson. Yes! is still teach less, learn more (TLLM), make the learners the centre of learning activities. teachers learn to use the video analysis software, design worksheets to implement meaningful ICT lessons. Students will submit their source file .trk with this file, their analysis is saved in the file and assess by the teacher if need. Teacher can also support the students analysis by examining the .trk and check the analysis. Students will submit a written report in .doc or .pdf which the rubrics for assessment is shared to the students as well. Do you consider the ICT lesson a success? What went well? What would you do differently next time? The richness of the activity and learning is a closer proxy to real life learning, thus we hope will prepare the students better for life, instead of just for examinations. It is a level wide scaling. 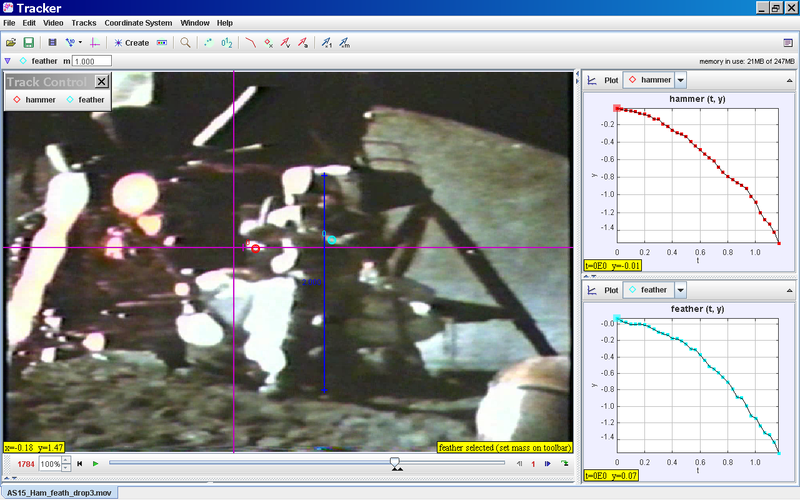 Use the video analysis and modeling software http://www.cabrillo.edu/~dbrown/tracker/, to support their investigation of one sport activity or event and able to perform an in-depth study of the science (especially physics) of sports. video used by students to learn. can't figure out where the video came from, trying to attribute the authors, if you know, please post them. Mark the position of this 305 g ball as it falls and bounces four times. Then paste this data into a spreadsheet. Delete the horizontal position values since they are not relevant to our needs. Use the meter stick taped to the right door frame in the video for scaling purposes. Translate the origin to the lowest position marked in any frame so that the floor will be the zero reference point for potential energy. Plots of position-time, velocity-time, and acceleration-time are useful. Also of interest will be a force-time graph, where force is calculated by applying Newton’s 2nd Law to the acceleration values (F = ma). The position-time plot will be “piecewise” quadratic and have one-half the value of the acceleration due to gravity as its square term coefficient (i.e., y = 4.9x2). The velocity-time graph will be “piecewise” linear and have the acceleration due to gravity as the slope of each section. The acceleration-time plot should be “piecewise” constant, with “spikes” at each bounce. 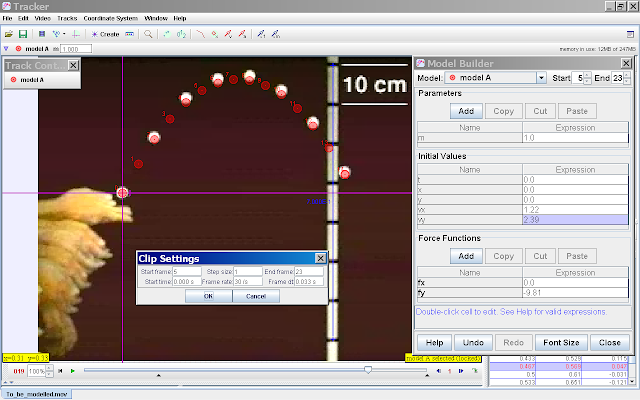 You can cut and paste portions of this data into new spreadsheet columns and graph the results to obtain equations that give the acceleration of the ball as it rises and falls. A gravitational potential energy-time plot can be made by direct calculation of the position data (PE = mgh). Once velocity values are known, a kinetic energy-time plot is easily made (KE = 0.5mv2). Paste the two energy columns side by side in a new spreadsheet and manipulate the next column so that it gives their sum (Total Mechanical Energy = Gravitational Potential Energy + Kinetic Energy). You now have data for potential energy, kinetic energy, and total energy of the falling and bouncing ball. Plot each of these on the same graph for emphasis. You can now evaluate how much energy was either lost or conserved in each bounce. Each of these four video clips shows one moving cart colliding with a stationary cart. Using DataPoint, you will need to mark one of the carts, copy and paste that data into a spreadsheet, then go back to DataPoint, mark the other cart, and paste that data into the spreadsheet next to the first cart’s data. Make sure that the times for each cart’s marks correspond to the other’s. The y values have no use in any of these clips and may be deleted from the spreadsheet since all motion is horizontal. It is probably best to position your origin at the leftmost position marked. The meter stick in the foreground should be used for scaling. Once you have positions marked for each cart, a position-time plot may be made. Slopes of each line segment may be used to obtain each cart’s velocity before and after the collision. Data in the spreadsheet should be manipulated in order to determine velocities. Velocity-time graphs for each cart should also prove interesting. Once the velocities of each cart are known, it is easy to make kinetic energy (KE = 0.5mv2) and momentum (p = mv) calculations. For collisions, we always want to compare the total momentum and total kinetic energy before the collision with the totals after the collision. These sums can be easily computed using the spreadsheet. Momentum is conserved in both elastic and inelastic collisions; kinetic energy is only conserved in elastic collisions. Therefore, the total momentum before the collision should be equal to the total momentum after the collision, but the total kinetic energy after the collision should be less than the total kinetic energy before the collision. the trk source files are also shared here. need to design a worksheet just from this! I give permission to use this video for educational purposes even before you need to ask for it! innovative copyright right? * Attribution — You must give the original author credit. Some notes when making video on your own. video taken by camera which was in some format unreadable by tracker *.MPG. use Free Video Converter: Any Video Converter Freeware http://www.any-video-converter.com/products/for_video_free/ to convert to *.mp4 a format that tracker can read. select Encode Pass == 2 very important else there may be frames that don't change thus the data from tracker will be poorly tracked! no sure this video belongs to who and where. decided to try it out myself. if the assumption of the man in space suit is 2.0 m, the value of g on moon is roughly 1.6 to 2.0 m/s^2 from my analysis. this activity is indeed becoming scientist! something i thought that could be shared as one of the feedback in YJC tracker scaling, the comment was "he or she or the group did not feel they are thinking like scientist". Hello, I recently encountered such a problem, and finally a friend introduced me a mts converter software, the effect is very good, I was the first trial, I feel good on the purchase of a long-term use, I think you can try this software and feel the results and then decide or need. Thank you very much My StudyGeek is now on the go! It is great to know that tracker include the auto tracking function. I am going to try it.